Next in the series on Ozark Mountain Jerky Co. is this Peppered variety. See my previous review of their Original. Ozark Mountain Jerky Co. is a brand of Frickenschmidt Foods based in Lockwood, MO. The company started in 1988 by Allen Frickenschmidt, who oversees operations, while his family members handle all the other duties. In 2008, the company stepped up from state inspection to USDA inspection. That allowed the company to go national with its products, and spurned the launch of their Ozark Mountain Jerky brand. The brand sells only two varieties of beef jerky from its website, this Peppered, and the Original I reviewed earlier. Beef, water, salt, sugar, dextrose, brown sugar, liquid smoke, spices, sodium erythorbate. The first thing I taste from the surface of these pieces is a black pepper flavor, with just light smokiness, and a faint bit of sweet. The saltiness comes in with some sucking. The chewing flavor is largely more of the same, except with a little bit more sweet, and some natural meat flavors. 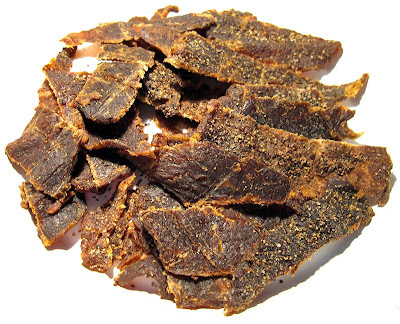 For being dubbed a Peppered variety of beef jerky, I'm certainly getting a lot of black pepper flavor, coming in strong on the surface flavors and strong in the chewing flavors. After eating several pieces the intensity picks up more, and the burn tends to numb my tongue somewhat, making it difficult to taste the full flavor of this jerky. The natural meat flavors are noticeable, but unlike with the Original variety, it takes second fiddle to much stronger black pepper flavor. It has the same "cooked meat" flavor as the Original. The saltiness seems to be at a moderate intensity for the most part, but it feels like it's much higher, perhaps aggravated by the peppery burn. The sweetness I mentioned earlier is in a light amount and for the most part I doubt you'll notice much, but it does add a little more body to the overall flavor. That "saucy" flavor I described in the Original variety is also there, but doesn't stays behind the scenes. Overall, what you'll notice in this the most is a strong black pepper flavor, strong enough to create a light burn, and may even numb your tongue a little bit. You'll notice some natural meat flavors, and a good deal of saltiness. 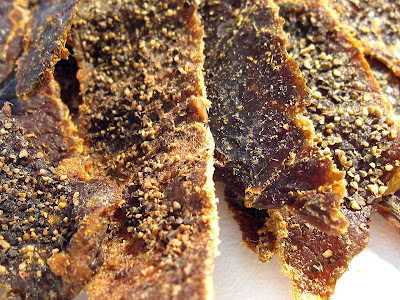 This is a dry jerky, but with pieces having a soft and flexible feel, unlike the Original variety which also some hard and brittle pieces. Pieces seem to tear apart fairly easily, and chewing is easy. The chewing texture for most pieces starts out feeling soft and flexible, with just a bit of rubbery resistance, but seems to chew down to a soft mass easily and quickly enough. At that point, it has a steak-like chewing texture, comparable to a steak cooked well done. Compare that to the Original variety, where I said it felt quite crumbly. I think the difference are either due to differences in the batch, or the Original variety was older, or somehow the package was compromised and the meat dried out. I'm going to assume this Peppered variety I'm eating now is more representative of all of Ozark Mountain's jery. Most pieces have some visible chunks or streaks of fat, some large some small. I didn't find any pieces with gristle unlike what I found with the Original variety. I didn't find much stringy sinews. In terms of clean eating, my fingers pick up some bits of black pepper, and I do see and feel some grains of pepper on my jeans. Frickenschmidt Foods sells this jerky from its website at a price of $18.00 for 1 pound (4 4oz bags). I bought 2 pounds, in two different varieties. Add to that shipping costs of $8.50, and it works out to a total of $44.50. That equates to a price of $1.39 per ounce. For general jerky snacking purposes, at the $1.39 price per ounce, this seems to provide a good value. I get an average amount of snackability for its decent flavor, easy eating, and good chewing texture. The $1.39 price per ounce is actually cheaper than what you'd pay at the grocery store for a mass-market brand, but I think you're getting comparable quality. As a Peppered variety, at the same $1.39 price per ounce, it's a good value. I'm getting a lot of black pepper flavor, and combined with the good value as a general jerky, I don't think you can go wrong for your money if you love peppered jerky. 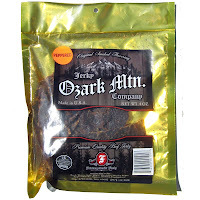 This Peppered variety from Ozark Mountain Jerky Co. has a strong black pepper flavor that seems to provide the most noticeable flavor of all. It also offers the same natural meat flavor I found in the brand's Original variety, along with a well-noticed saltiness. You'll also notice a little bit of sweet, and a saucy flavor. It has a decent flavor. I think it's a better jerky than the Original variety, with the addition of black pepper adding more of a bite. But the Original variety I reviewed had a considerably different meat consistency, being more stiff and brittle, and chewed quite crumbly. This Peppered variety was more soft and flexible. I think the Original variety I reviewed was an older jerky, and was dried out, and thereby had compromised the flavor. But still, in thinking about the overall snackability, it seems to provide about the same as I would get from a Peppered variety of Oberto, or Jack Link's. It's got a decent amount, which gets it up to an average rating in my book, but in looking for reason to consider it better, I couldn't find anything else. My recommended beer variety for this, a light tasting cream ale or kolsch.